The South Korean government debt market swung heavily this week due to mixed signs from fiscal and monetary authorities over the lengthy suspension of an interest rate hike against tightening moves in developed economies. In a rare comment from a government minister, made even rarer as it came from the cabinet head instead of the chief of economic policy, Prime Minister Lee Nak-yon during Thursday’s legislative hearing indicated the central bank should be more proactive in raising the interest rate. “I am in agreement with the belief that more serious thought should be paid (on raising interest rates) amid the capital flight risk from the widening rate gap between Korea and the U.S. and mounting burden on household debt,” said the politician-turned-statesman. His comment came as the government later in the day announced another package of real estate measures targeting the property-rich that included tougher tax levies as well as loan regulations to cool the renewed housing heat in Seoul and other cities. The liberal government, which has embarked on an aggressive campaign to press down housing prices, partly blames the cheap interest rate environment behind the unquenchable demand in the housing market. The market, lethargic due to a policy bind from worsening economic conditions and depressed inflation, gained activity with some beginning to bet on a sooner-than-expected hike from government pressure, although the interest rate policy is strictly the central bank’s business. The three-year government bond yield rose 2.8 basis points to close Thursday at 1.921 percent, dramatically reversing course after dropping below 1.90 percent to a one-year low the previous day. The yield had plunged as the market struck down the option of a hike at the next October meeting after Shin In-seok, a monetary policy committee member from the Bank of Korea (BOK), expressed concerns about the stubbornly subdued inflation. On Friday, it gained 3.9 basis points and closed at 1.960 percent. Korea’s policy rate has stayed unchanged at 1.5 percent since the BOK made the first raise in more than five years from the record-low 1.25 percent in line with the U.S. normalization moves. The stalled lifting has widened the gap with the U.S. fed fund rates, now at 1.75-2.00 percent. The Fed is expected to deliver one to two more rate hikes by the year-end. Even as central banks around the world have been moving along with normalization, Korea has been stuck in a policy bind as it battles the worst job conditions since the 2008 global financial crisis. Inflation has also stayed stubbornly low due to lackluster domestic demand. The country’s headline inflation in August edged up 1.4 percent from a year earlier, hovering below the 2.0 percent target for 11 months in a row. BOK Senior Deputy Governor Yoon Myun-shik on Friday stressed on the central bank’s independence in policymaking and warned against the risk of using interest rates solely as a tool to curb the overheated housing market. “Monetary policy may be important in stabilizing housing prices and overall macroeconomic conditions but interest rates alone cannot tame housing prices,” he said. 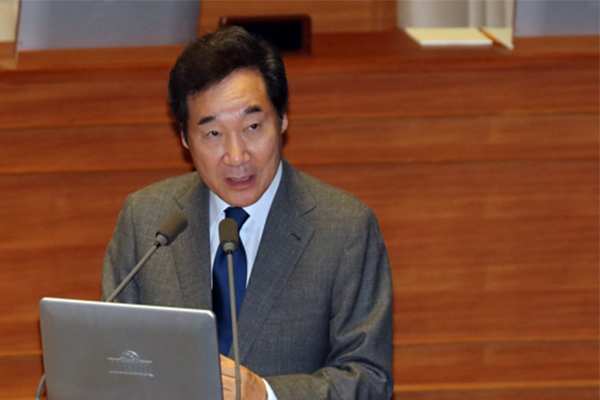 Deputy Prime Minister Kim Dong-yeon also tried to put out the fire caused by Lee’s comment, saying that interest rate policy strictly lies with the central bank’s monetary policy board.